Closet Works offers a wide array of storage options. The company's patent pending 360-degree organizer. The Closet Works/Plus Closets 60,000 sq. ft. manufacturing facility in Elmhurst, Illinois. 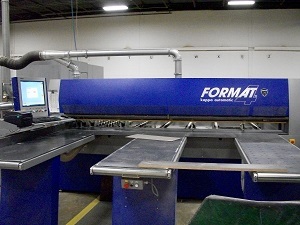 Products are processed using one of the facility's three Felder Format Profit H10 CNC routers. 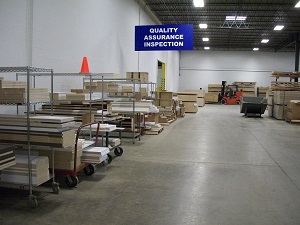 Products must pass through a quality inspection area before being approved. Orders are shipped to dealers in a 4x8 ft. durable wood floor skid box. A Felder Kappa Automatic beam saw. Closet Works has a long history of giving customers exactly what they want. For nearly three decades, the family-owned, Elmhurst, Illinois-based wholesale closet manufacturer has offered a multitude of storage options for its customers. An impressive array of customization options, along with a highly-organized, efficient, and clean manufacturing process have lead the company to nearly double its size in three years. Since taking over Closet Works in 2013 — which consists of a retail, direct-to-customer division with the same name, as well as a division that sells through dealers called Plus Closets® — father and son duo Frank and Tom Happ saw tremendous growth. Realizing the Great Recession was coming to an end, the Happs decided to double the size of the original manufacturing facility to 60,000 sq. ft., invest $2.5 million in all new Felder machinery, and hire additional sales staff. Total sales climbed to $10.8 from $10 million in the first year. In 2014, sales grew again, and then again in 2015. Since the Happs took over, sales have nearly doubled. But current company president Tom Happ doesn't take full credit. He attributes the recent success to the existing company and employees. We knew it was a good company and we bought it at a good time, Happ said. Most of our employees are experienced and have been with the company for a while. When you give them more space and better machines, the result can only be good. Closet Works is primarily a custom storage system manufacturer focusing on wholesale closet systems, closet organizers and overall wholesale storage solutions. Customers range from kitchen and bath dealers, remodelers, custom builders, interior designers, and existing homeowners. Their closets offer customers an abundance of accessories including pull-out storage, jewelry dividers, designer hardware, 360 degree organizers, tie racks, tilt hampers, glass doors, stealth locks, shoe cubbies, and more. They also build pantries, mudrooms, laundry rooms, offices, wall beds, media centers, and garages. Customers can customize orders down to the smallest detail. Our large supply chain supports our designers, which is important," said Happ. "Our designers can confidently work with our customers and know that they will be able to grant all of their wishes. It also makes it easy for our sales staff. Something the company takes great pride in is its patent-pending 360-degree closet organizer. The organizer comes in two configurations, the Shoe Spinner and the Valet. The Shoe Spinner consists of all shelving and is ideal for shoes, purses, and folded items. The Valet also consists of shelving, but comes with drawers and space for long hanging items. Both configurations come in 20 different colors, and both allow for the shelves to be adjusted to accommodate different item heights. At this year's International Builders Show, the 360-degree organizer was selected as a finalist for the "Best Indoor Living Product" category. In addition to its large product outline and big output, the company has a showroom in Chicago — something that Happ says sets Closet Works apart. Many of our competitors don't even have a showroom, and ours is open seven days a week, he said. Customer service is also a priority. We stand behind our product and we offer quality, said Happ. We call our customers 'raving' fans because they are always impressed. The process begins with the design phase. For Closet Works, designers meet with a customer at their home, and work with them closely to construct a design. That design is then brought to life on the computer screen using Cabinet Vision software. Designers complete and submit the design to manufacturing within 48 hours. For Plus Closets, dealers can send in a sketch and have a system drawn for them, or draw the system themselves using Cabinet Vision. Cabinet Vision access and training is offered for a small fee. Once trained, dealers can send designs directly to one of the facility's CNC machines — from anywhere in the U.S.
Once the design is finalized, a list of materials needed is given to manufacturing. 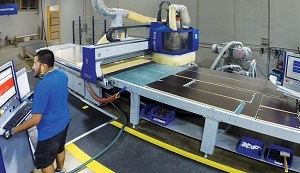 A material handler makes sure proper material is loaded into one of three Felder Format Profit H10 CNC routers. Nothing is pre-cut. The product is then sent to one of four Felder Perfect 710 edgebanders where it is edgebanded on all exposed sides, including the bottom. Thirty colors are offered, each with a corresponding matching edgeband. Furniture-grade 3/4" thick thermally-fused laminate, wood veneers, and poly-lac high gloss are all used. An adjustable hanger bracket suspension system is used to hang panels and allow for adjustment in all directions. For fixed shelves, Plus Closets uses through-anchor construction that allows for continuous shelving at the same height. Preinstall locking cams are installed and secured to the shelf. After the system is manufactured, each panel is sent to a quality inspection area. Material being sent to dealers is labeled to correspond to installation instructions. 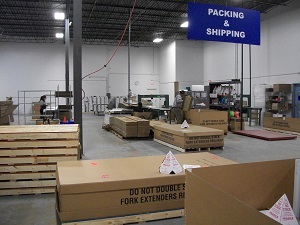 For shipments containing multiple projects, each package is color-coded based on the project. Orders are then shipped in a 4x8 ft. durable wood floor skid box. Within business 10 days of ordering, each order ships out ready-to-install. A smooth process allows us to make each order quickly, said Happ. Our labels contain all the necessary information — making the installer's job easier. In 2013, Closet Works invested $2.5 million in all Felder machinery. The Felder lineup includes three Felder Profit H10 CNC routers, a Kappa Automatic beam saw for cutting trim, a C-Express 920 for drilling and milling panels, and four Perfect 710 edgebanders. Each machine operates with its own dust collector to minimize risk of fire and to achieve an ultra-level of cleanliness. We chose Felder because their machinery is consistent and reliable, and gives us high quality and scalability, Happ said. They also taught our guys to use them in the correct way. Their machines are simple to use, and very user-friendly. Products flow seamlessly through the organized shop. Signs such as "CNC Machining Center #1", "Quality Assurance Inspection", and "Rod & Rail" are located above each machine and section, allowing easy navigation for the company's 100 employees. The shop is divided into two equally-sized sections — manufacturing and material handling. Soft-close drawers are built by suppliers and then assembled in the material handling area. Undermount slides are assembled first, and then drawer faces are placed on. A transition way from PVC to straight wood is currently taking place. Storage is maximized, with material reaching all the way to the ceiling. A testing area is also utilized. The prototyping area is where we test new products or things we working on, said Happ. It's utilized by all teams, and it really reduces problems in the field. LED lighting seems to be especially on the rise, and all wires must be hidden, said Marzena Hallman, director of marketing and sales. We've expanded our lighting options to include more LEDs with more options. Hallman says storage remains the most important however. People want storage. Storage, storage, storage. They want 360-degree storage with all the standard accessories. They want shelves, and they want them to rotate. They want complete control over their storage, and we can give it to them. Wall beds, textured laminates, and mimicking wood are also popular. The company hopes to continue growing by expanding its dealer base, adding to its product line, and by fine-tuning its manufacturing process even further. We recently opened a bigger showroom, and have doubled our dealer base since 2013, but we aren't done, said Happ. We are always looking for new products — things we can add to our product line. Our primary goal is to grow. Closet Works has been crafting sanctuaries and creating a sense of order for Chicagoland homes for almost three decades. They are currently celebrating nearly 28 years of creating custom storage solutions in the Chicagoland area and beyond. For more information on Closet Works call toll-free at 800-4-CLOSET (800-425-6738).